Aerocom Systems, Inc. will be taking part in this year’s Global Gaming Expo, the world’s leading show for the casino-entertainment industry. Many outside the industry might be surprised to see a global provider of pneumatic tube systems established in the casino and entertainment sector, but Aerocom has been a leading force in the industry for decades. Many casinos use pneumatic tubes to safely transfer assets from point to point. The advanced security features that Aerocom’s systems offer are a necessity to transfer high value items such as markers. With secure carrier locks, live transaction monitoring systems and carrier tracking, Aerocom’s pneumatic tubes offer the features that casinos need to stay secure and efficient. The expo will take place from September 27-29, 2016, and will be held at the Sands Expo in Las Vegas, Nevada. 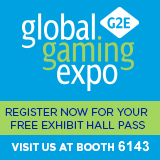 The G2E boasts the largest show floor in North America, and will feature keynotes, special events and networking opportunities. Aerocom will be one of more than 450 exhibitors presenting their newest products. Interested in learning more about Aerocom’s involvement in the casino-entertainment industry? Contact us today.